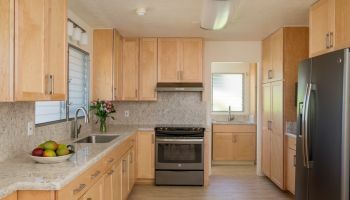 Recently, a Mililani couple planning a kitchen remodel visited Homeowners Design Center in search of a complete upgrade of their bathrooms and kitchen. The homeowners had been referred to Homeowners Design Center from two separate sources--a contractor and a friend--so they had high expectations from the start. Their kitchen in Mililani was dated and very small. So small and cramped that two people working together in the kitchen would easily bump and crowd each other. They wanted the kitchen remodel to open up the space, install more storage and restyle the room to better match their tastes. To watch the video and hear kitchen designer Jessica Omoto describe this kitchen remodel, just click on the image below. During the kitchen remodel, three walls separating two other under-utilized rooms were removed, which virtually tripled the size of the kitchen. This dramatic transformation turned their once tiny room into a massive space, perfect for entertaining and preparing family meals. A major remodel as three load-bearing walls were removed combining three spaces into one. To replace the old countertops, Homeowners Design Center installed an elegant white engineered quartz called torquay made by Cambria. They chose this material for the kitchen remodel because engineered quartz is known to be low-maintenance and easy to clean, and because the snowy color with streaks and patches of light gray perfectly complemented the warm cherry wood cabinets in a Shaker style by Diamond. To add some contrast to the wooden cabinets, several of the cabinets featured glass doors. The original kitchen was so small, two people could barely work in the kitchen without bumping into each other. For the flooring, the homeowners selected Engage brand vinyl planks. The clients were attracted to this vinyl flooring for its moisture resistance and durability, but its striking resemblance to all natural wood cinched it for the kitchen remodel because it matched perfectly with the cabinets. Installation of recessed lighting in the soffit and pendant lights above the island helped illuminate the space. To achieve their storage goals and to break up the shape of the kitchen, the homeowners must have item was a spacious walk-in corner pantry with a glass door. 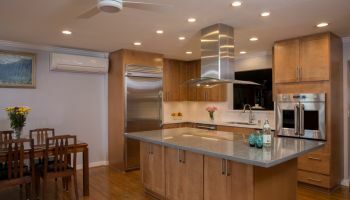 The finishing touches of this kitchen remodel were stainless steel KitchenAid appliances. The vinyl plank flooring has an uncanny resemblance to real natural wood flooring. The bathroom remodels involved the hall and master bathrooms. Both were refinished with acrylic solid surface by HI-MACS for easy cleaning and maintenance and included soap & shampoo caddies. The tub in the master bathroom was replaced with a walk-in shower and included aging-in-place features like grab-bars and a foot rest to make leg-shaving easier and also a sit-down area in front of the vanity space so the lady of the house can make herself up for the day or a night out. The cabinets in both bathrooms were the same cherry wood Diamond cabinets featuring open shelves for additional storage. The master bathroom features solid surface countertops by HI-MACS and aging-in-place features such as grab bars and a walk-in shower. The homeowners began with a dream of changing their kitchen and bathrooms into functional, usable, attractive spaces. They also wanted easy to maintain and elegant kitchen and bathroom features. By working closely with the homeowners, Homeowners Design Center was able to help them achieve their kitchen remodel dream. The hall bathroom also featured solid surface HI-MACS countertops and grab bars, with Shaker style cherry cabinets from Diamond. For more information on how Homeowners Design Center can help you with your kitchen remodel, or to see more of their beautiful kitchens, just click on the company name or on any of the photos above.